The University of Alabama football program has produced several legendary players over the years. Joe Namath, Bart Starr, Ken Stabler, Ozzie Newsome and Trent Richardson are just some of the notable football alumni. 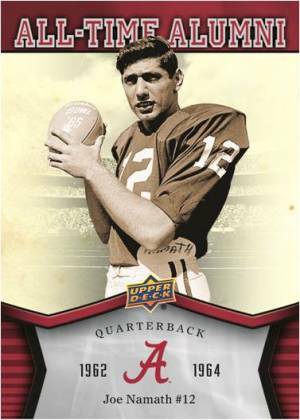 2012 Upper Deck University of Alabama Football might target both passionate Crimson Tide collectors directly, but the checklist is stacked enough to appeal to a broader audience. 2012 Upper Deck University of Alabama Football boxes come with 24 packs of eight cards. Every box promises one autograph from a Crimson Tide alumnus. Every pack also has at least two inserts leading to a ton of variety. One of the main inserts are the Light F/X Crimson Tide Icons, which fall two per box. Other inserts include All-Time Alumni, National Champions, and NCAA All-Americans. The autograph checklist is led by signed base set parallels, which fall 1:30 packs. Autographed versions of the basic inserts come numbered. All-Time Alumni and National Champions come with up to three signatures on a single card. Namath, Starr, Stabler, Newsome, Richardson, Mark Ingram, Shaun Alexander and John Hannah are among the autographs in the set. 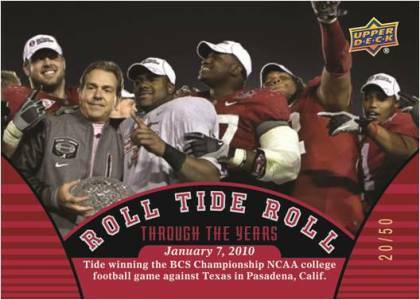 The 2012 Upper Deck University of Alabama Football set has 100 cards: 90 base cards and ten Roll Tide Through the Years cards. Good: Great return from each box. Reasonably priced. Fun to open. Checklist loaded with some of the school's greatest players. Bad: Too many inserts. Difficult to organize inserts into their proper sets. Sticker autographs. The Bottom Line: Roll Tide! This product is a gem for any Alabama fan. Actually, it's great for anyone who loves college football. 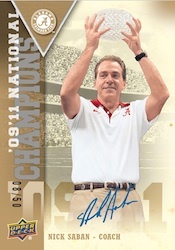 At this price, it's tough to go wrong getting cards featuring Bart Starr, Joe Namath, Trent Richardson, Julio Jones, and two of the game’s greatest coaches in Nick Saban and Paul "Bear" Bryant. Base cards mix nice in-action shots and some fun poses. There is a lack of innovation as this product follows the same template design of the previous Upper Deck university-themed products. I would like to see a design more unique to each team rather than just changing the logo. I really like the Icons insert that features a HoloFX metal look. The downside is that they are condition sensitive. Both of the cards from the box I opened would be lucky to grade at an 8. I really didn't like the choice of colors on the All-Time Alumni, All-Americans, and National Champions inserts. The cream color just doesn't fit. I think it would've looked better with white or grey. I asked my wife what she though. She doesn't collect cards but is a college football fan. She said that other than the Icons and the autographs, there really wasn't much that would make her want to keep the cards. The other downside is that the autographs are all on stickers. This leads to some of the signatures being cut off. That said, this could also be considered a positive because it limits the risk of having redemptions. The 100-card base set features some of the greatest players and coaches of all-time. There is a great balance of players available from all decades, which makes it appealing to both old and young collectors. I liked getting a crash course in the history of Alabama football through the Roll Tide, Roll subset. There are lots of inserts: All-Time Alumni, All-Americans, and National Champions. The All-Time Alumni and National Champions also have dual and triple versions. I would've preferred to see the dual and triples stick to the autographed versions, or be a little more difficult to pull. With an SRP of only $50 per hobby box, collectors get a lot of bang for their buck. While you may not pull a Nick Saban autograph that is going for over $400 on the secondary market, even the common autographs are doing well. 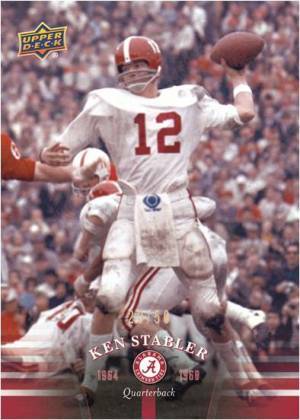 More than anything, I think these cards are of personal value for Alabama fans to have a product celebrating the rich history of their football program. I'm not a big Alabama fan but I really enjoyed opening this product. I realized I didn't know as much as I thought I did about football when I pulled cards of players that I didn't know played for Alabama, i.e. Bart Starr. It is also fun for set builders like me. With most boxes, collectors should be able to put together the complete base set. For me, the anticipation of possibly pulling a Nick Saban autograph made it especially fun. 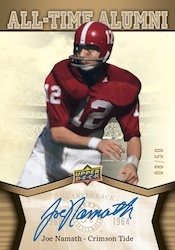 I can only imagine what kind of fun would be added if there was a chance of pulling a Bear Bryant cut signature or even if Upper Deck added some type of Bear Bryant memorabilia. The fun factor, or at least the suspense factor, does drop significantly once the promised autograph is pulled. I’m a die-hard Alabama fan and can appreciate the tradition and storied history of the University of Alabama. Any college football fan can and will enjoy this product! Roll Tide!!! This was the exact checklist I had been looking for and he took time to make this and put on his website. That is a great guy and Roll Tide! VERY NICE. EXACTLY WHAT I WAS LOOKING FOR.